Our reball hall in Mýto pleased not only the fans of speedball. Do not expect wooden obstacles or paintballs! 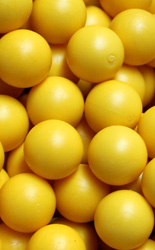 There are special rubber balls with air obstacles called Sup'AirBall. The surface of the hall is made with three layer's load carpet, so you can fearless fall down, jump or slide. Here in this hall there is no problem to shoot even 4000 reballs per person in 3 hours. There is not much running, so you can enjoy real unlimited paintball event. There are 15 000 reballs at your disposal. At the end of the event there is a special collector machine and shovels.